Today is New Year’s Eve, and therefore many American food blogs are putting up their most interesting spins on Hoppin’ John, a peas and rice dish from the South. I love Hoppin’ John (I mean, it’s hard to go wrong with pork, black-eyed peas, and greens), but I figure there’s enough of that going around today. And besides, what are you going to eat tomorrow when the party’s over and you need to make something restorative without necessarily heading to the store? Enter split pea soup. Split peas get a bad rap because they can be a little blah, and a lot of people don’t appreciate their color (there’s a reason ‘Split Pea Soup’ isn’t Pantone’s Color of the Year). But split peas are an absolute staple in our house for three reasons: (1) we are not afraid of olive-drab soup, because it is delicious when handled correctly; (2) split peas keep forever in a canister in the back of the pantry; (3) split pea soup is a great neutral canvas for taking in so, so many interesting directions. So we’re making split pea soup. But not your usual split pea soup, with the carrots and celery and the ham. I love that soup, but remember: we’re making this with what you have lying around. (Well, what I have lying around. I know my pantry’s sometimes quirky.) Bacon? Check: I’m forever overbuying it. Oranges? Yep, it’s that time of year when everyone seems to have a little sack of clementines in the fridge. Onions, garlic, and chiles? If I’m missing these, there’s a true culinary emergency happening. Add in some yogurt or sour cream for richness and some fruity, tropical hot sauce for a kick (I used a local brand with mango, papaya, pineapple, and guayaba in it — you see where I’m going with this), and you’ve got a quick easy dish that will carry you into the New Year with a full stomach and little effort. Best wishes for the coming year, and thanks for reading! In a pressure cooker, cook the bacon slowly to render the fat. 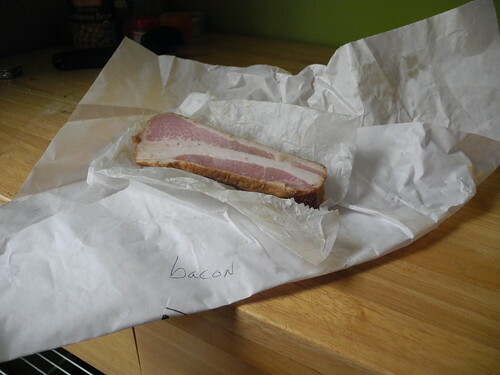 If you have very fatty bacon you can remove some of the fat before proceeding, but you do want a tablespoon or two still in the pot to flavor the soup and prevent foaming in the cooker. 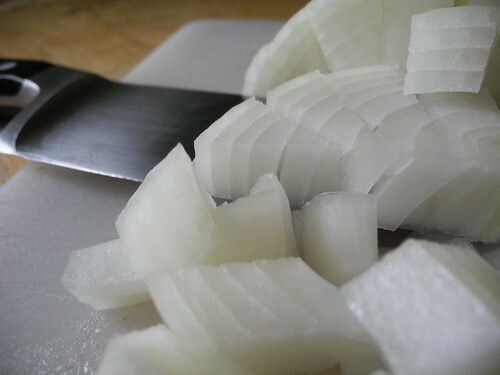 Add the onion to the bacon and cook over medium-high heat until translucent. 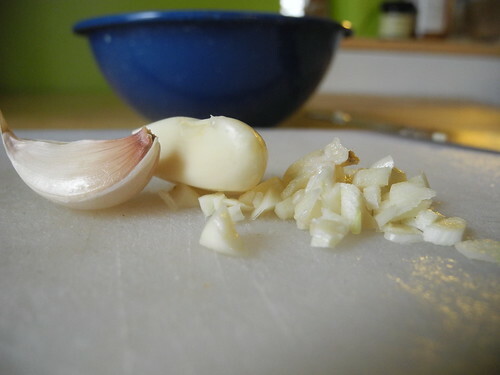 Add the garlic and cook another 30 seconds or so. Add the split peas, chiles, and stock to the pot. 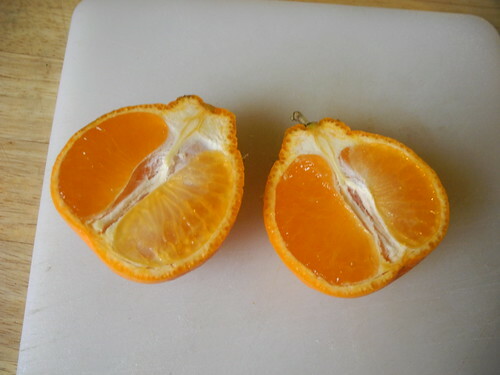 Squeeze the orange halves into the pot and drop in the peels. Cover the pressure cooker, seal, and set over high heat until steam begins to hiss out. Reduce heat to low (just enough to maintain a slight whistle of steam), and cook 20 minutes (at 10 pounds pressure). Place pressure cooker in sink and run cold water over the lid to release pressure, 3-5 minutes. Remove orange halves and chiles. 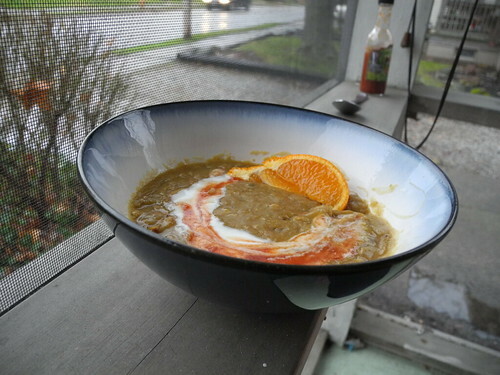 Stir soup to check texture; depending on the juiciness of your oranges and the age of your peas, you may need to return the soup to medium heat for a few minutes to thicken it to your liking. Serve with yogurt or sour cream and with a fruity hot sauce. You could certainly omit the bacon here for a vegetarian dish. Start with the second step, adding 2 tablespoons of oil to replace the bacon fat. If you’re going this route, I recommend a chipotle hot sauce for its rich, smoky flavor. 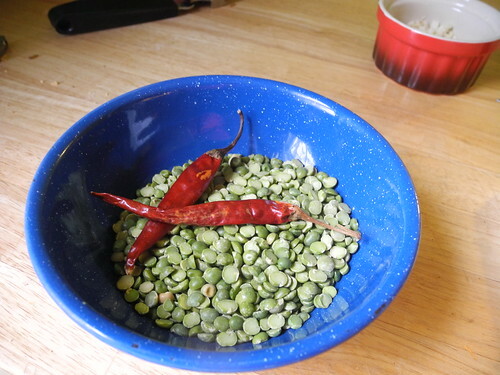 You could also make this without a pressure cooker: simmer covered for 45-60 minutes, until the peas are falling apart. You may need to add a little more liquid, depending on how much steam escapes from the pot during cooking (and depending on how thick you like your soup! ).